The 3M Bair Hugger is a forced air warming blanket used during hip and knee replacement surgeries that allows for the maintenance of an optimum body temperature. Launched on the market in 1988, the Bair Hugger was marketed by Arizant Healthcare, Inc. until 2010, when Arizant was acquired by the 3M Company. Because they cannot regulate their body temperature, anesthetized patients are at risk for hypothermia and a host of related complications. Research has also shown that keeping patients warm during surgery leads to less bleeding, shorter hospital stays, and lower mortality rates. As such, a number of methods, including forced air warning blankets and pads, fluid warming systems, and intravenous fluid warming, have been developed to help surgical patients maintain optimal body temperature. The Bair Hugger consists of a disposable blanket that connects to a portable heater. 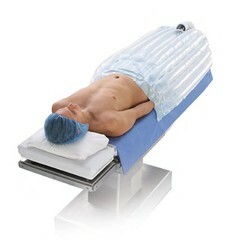 Intended for one-time use, the blanket disperses warm air over a patient’s body before, during and after surgery. The forced air warming blanket is touted by 3M as “a simple, cost-effective method to prevent unintended hypothermia and its complications.” Today, more than 50,000 Bair Huggers are being used in hospitals throughout the U.S.
Several years ago, Dr. Scott Augustine, the inventor of the Bair Hugger, warned hospitals to stop using the system after he came to believe that forced air warming blankets may spread bacteria associated with hospital-acquired infections when used in conjunction with implantable devices, such as artificial hips and knees. A number of Bair Hugger lawsuits also contend that the system can sweep contaminated air from the operating room floor and deposit it into the surgical site, placing patients at risk for MRSA, sepsis and other serious deep-joint infections. In recent years, a number of studies have suggested that these concerns are well-placed. The year prior, a group of surgeons in the U.K. reported a dramatic 74% decrease in deep joint infections when they discontinued using forced air warming blankets during total joint replacement surgery. Post-operative knee and hip replacement infections are difficult and costly to treat, and often require patients to undergo additional procedures, including revision surgery to remove and replace their implant. Bair Hugger lawsuits claim that the manufacturers of the forced air warming blanket were aware of its infection risk since at least 2009. Yet they continued to aggressively market the Bair Hugger as safe for use in both general and orthopedic surgeries. Individuals who allegedly developed Bair Hugger-related infections following hip or knee replacement surgery may be entitled to compensation for medical bills, lost wages, disability, and more. To learn more about filing a forced air warmer lawsuit, please call to discuss your case with one of our legal experts.